Providence Homes recently received the 2014 Builder of the Year Award from the St. Johns Builders Council. 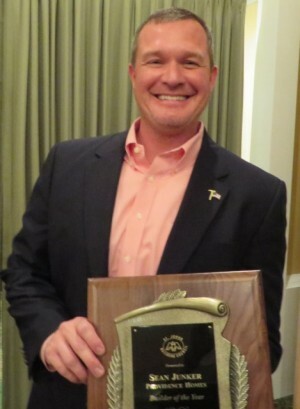 Providence Homes’ President and Chief Operations Officer, Sean Junker, accepted the award during a ceremony held December 6th at the Marsh Creek Country Club. The St. Johns Builders Council is part of the Northeast Florida Builders Association, representing Builders and Associate members in St. Johns County. Providence Homes was started in 1992 by Bill Cellar as a one-man, home-based operation, and has become one of the top 10 builders in the Jacksonville area, and the second largest locally owned residential builder. The company is known for its strict attention to detail and an unwavering commitment to excellence, as well as for being the only builder in the market that is building 100% Energy Star certified homes. “From the very outset, I wanted Providence Homes to build beautifully designed homes at affordable prices,” says CEO Bill Cellar. “It has always been my mission to deliver the best home-buying experience within our market and to treat our customers, employees, suppliers, and subcontractors with honesty, respect, and fairness.” Providence Homes is committed to providing the highest possible standards in residential construction. The Providence team strives to provide the finest service for their customers, fulfilling and then exceeding their expectations. That degree of care and commitment has earned Providence Homes an excellent reputation among homeowners, Realtors® and trade partners. Providence Homes can be found in many of the finest neighborhoods throughout St. Johns County, such as Nocatee, Durbin Crossing, Grovewood at World Golf Village, and St Johns Forest. And St. Johns was named as one of the best towns for families with children in Florida, thanks to an enviable combination of good schools, low crime, and a high number of single-family homes. It is a stable area, with good social networks for both children and parents, and creates a naturally kid-friendly community. Providence Homes is Jacksonville, Florida’s hometown builder. As one of the area’s largest locally owned home builders, we are committed to building beautifully designed, 100% Energy Star certified homes at an affordable price. No matter which neighborhood you choose in Clay, Duval, or St. Johns County, Providence Homes has been a name families can trust as a Jacksonville new home builder for more than 20 years. Visit providencehomesinc.com for more information.